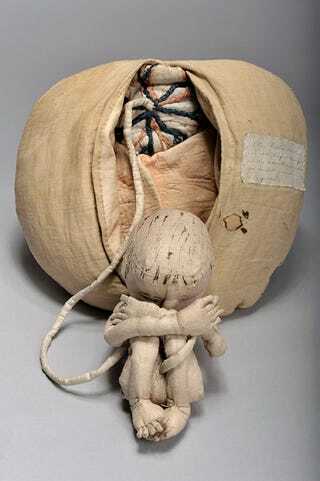 Don't call these fabric anatomical recreations creepy. They helped save thousands of lives in Europe and were the brainchild of a pioneering midwife. The images are of teaching instruments created and used by Angélique Marguerite Le Boursier du Coudray. She was a midwife who was commissioned to teach her techniques in rural communities to help reduce infant mortality rates in France. She was quite successful, teaching her skills to thousands of students, as well as surgeons and physicians. Retronaut has more pictures, which are completely mesmerizing and sort of disturbing, in a beautiful way (that sentence will get you an automatic degree at the Art Instiute).